It's midsummer, and daytime temperatures are hovering in the mid to high 30s °C (or 95-100 °F) around these parts. Sure it's a dry heat, since it is in Provence, but it's still pretty hard to bear, especially since we don't have air conditioning. This means that it's really hard to even contemplate standing in front of a hot stove cooking things. So I try to do things in small batches. For instance, we are eating a lot of eggplants (aubergines) because they are in season, delicious and so cheap - around 1 euro for 6 to 8 small to medium ones. 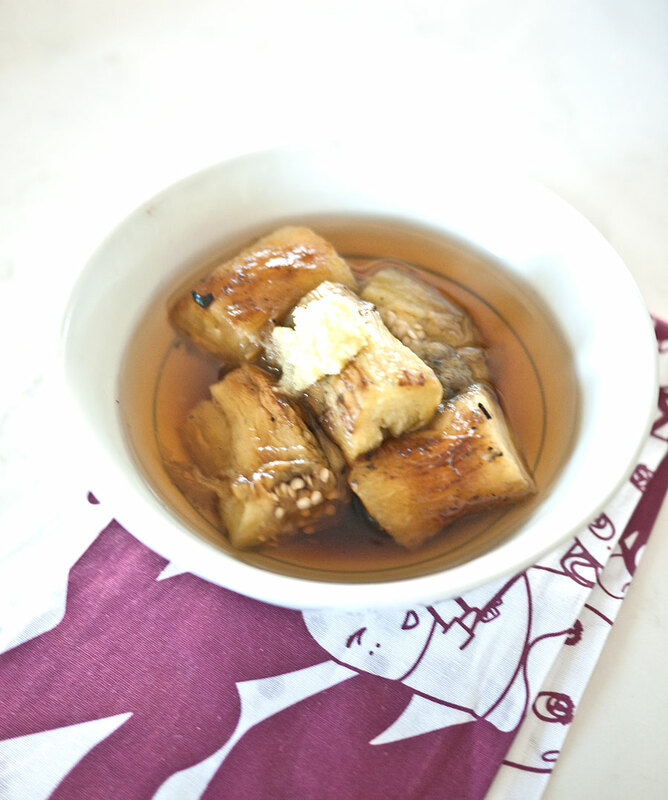 It's a bit hard to come up with different ways to cook them, but here's one of our favorites: simply grilled, and served in a well chilled soup with the refreshing addition of grated ginger. The one hot and slightly tedious part of the whole thing is grilling and peeling the eggplant. You have to grill them until they are charred all over, to get the skin to come off easily and to impart a slightly smoky flavor. The way I do it is to just put it on the grill of my gas range, over low heat, and keep turning it (it takes about 10-15 minutes) until the eggplants are as charred as these. 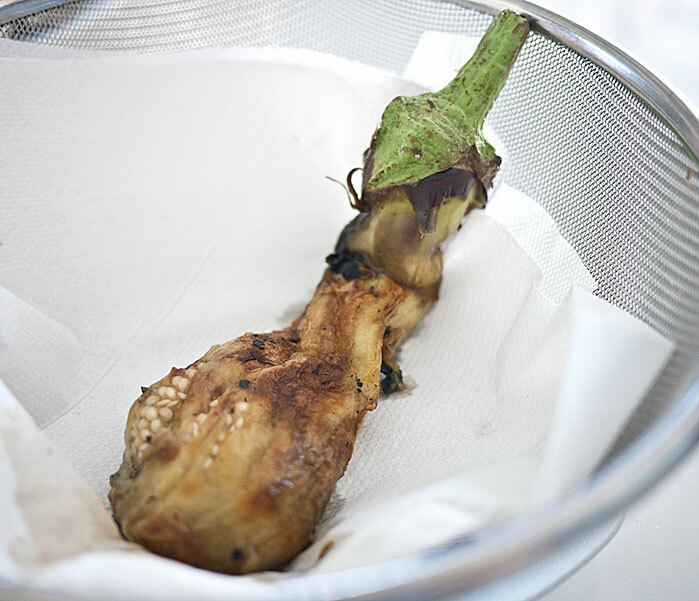 Note: Be sure to poke the eggplant a few times with a fork or a skewer before you start, to prevent it from bursting. If you are using your barbeque regularly, it's quite easy to do this on the side. Be sure to use small to medium eggplants, not huge ones (Asian/Japanese or Chinese ones cook the fastest). The ones here are about 3 to 4 cm or around 2 inches in diameter at their fattest parts. Once they are charred on the outside and tender and squishy to the touch, peel them quickly and carefully with your fingers while having a bowl of cold water on hand (or do this by the sink). 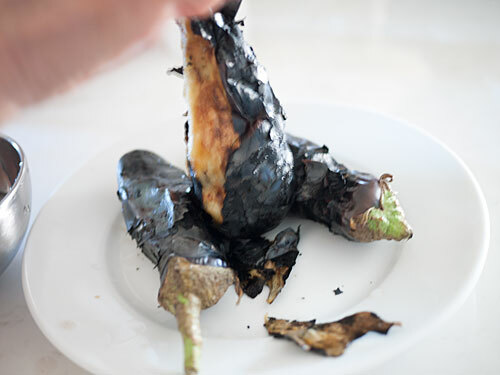 You need to do this while the eggplants are still hot or the skin will not come off cleanly. Don't burn yourself though! When they are cleanly peeled, let them rest for a while in a colander lined with paper towels or a clean kitchen towel. 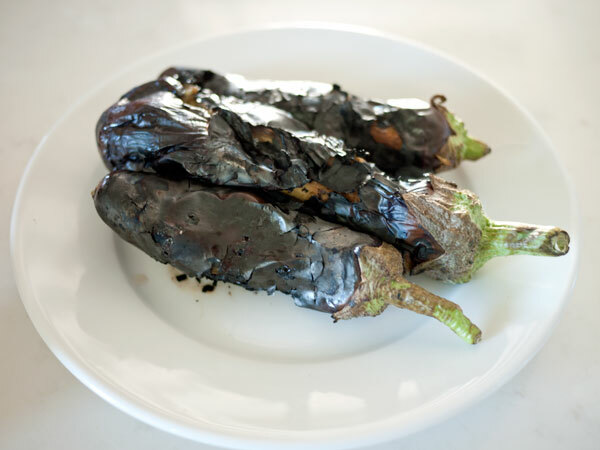 You can do this in advance, so one plan is to grill the eggplants the day before and have them the next day in the soup. Then all you need is a good dashi stock (use these instructions, or the way more detailed ones on this page. Instant dashi granules are OK too.) A clear vegetable stock can be used instead. A refreshing chilled summertime soup using eggplants or aubergines and fresh ginger. Grill the eggplants following the instructions above. Peel and leave to drain in the refrigerator. This can be done in advance. To serve, arrange the eggplant pieces in bowls. Pour the cold soup over them, and garnish with a generous amount of grated ginger. You can put the cut up eggplants in the soup and chill them together. The eggplant will soak up the soup flavor and become really delicious. Add the grated ginger just before serving. This can be made up to 2 days in advance and stored, well covered, in the refrigerator. The portion sizes are for small bowls to serve as part of a Japanese meal (instead of miso soup), but you may want to make bigger portions if you'd like to serve this as the soup course. 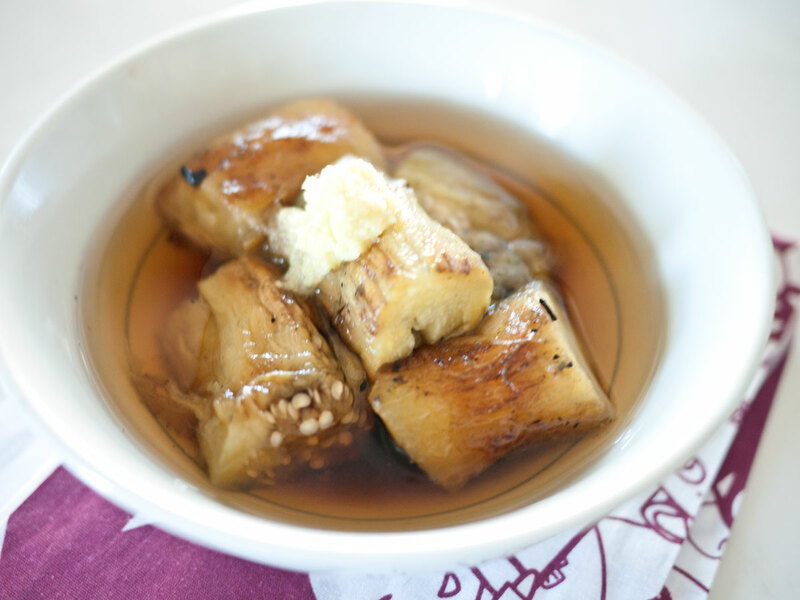 Alternatively, increase the proportion of eggplant to soup and serve as an _ohitashi_ side dish (maybe add a bit of soy sauce in that case to taste). Submitted by maki on 2015-07-20 17:11. Good to see "Just Hungry" in my inbox - welcome back! PS, your Kyoto guide was great on a recent trip. It's hard to find reliable suggestions, particularly when your language skills are rudimentary. Lots of memorable experiences! This looks and sounds like a great recipe in the heat. Thanks!